My job is an adventure, I have the chance to travel and explore, I get to be a tourist and a resident. My life is constantly changing. I have non-traditional work hours, and work, for that matter. I move every 6 months or so to different cities all over the world. With limited time in each city, I have found the best way to get the most out of the places I get to visit is to dive right in. When I learned that the New York Liberty had traded me to the Seattle Storm, I jumped online to research all the things I should be sure to see, do, and experience in this lovely city. 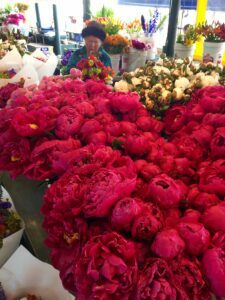 I stumbled upon the Visit Seattle website, and I am thrilled to be guest blogging to share some of my favorite parts of this great city with all of you! My name is Carolyn Swords. 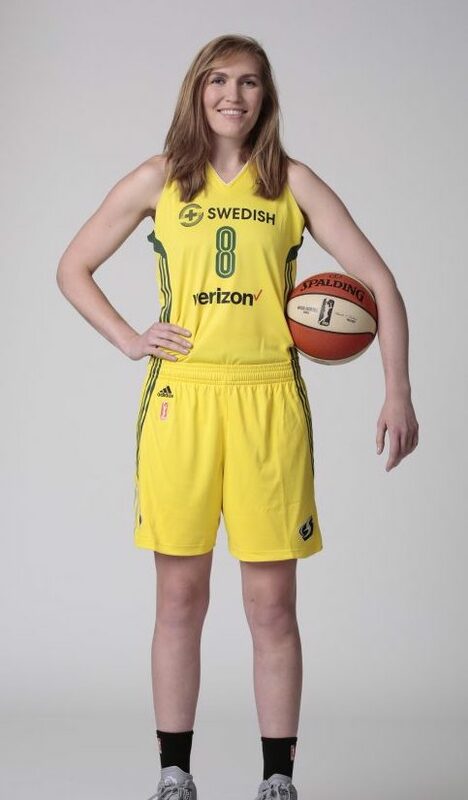 I am a member of the Seattle Storm, and this is my sixth season in the WNBA. In the off-season I have enjoyed incredible experiences overseas. I have played for teams in Spain, Turkey, Italy, Australia, and Poland. I grew up outside of Boston, and I attended Boston College. I graduated in 2011 with a Communication degree, and was drafted to the Chicago Sky. My most recent home in the W was with the New York Liberty. Seattle is my first west coast adventure! My practice and game schedule is demanding, and my job requires that I include good food and good rest into my routine outside the gym. I love those “Rome in a Day”-type travel guides, but honestly, that is not always practical. My games are most often on weekends, and I’m not sure coach would be thrilled if I spent a day on my feet, unable to give my best in training. That’s why I have tried to adopt a style of travel that’s a bit more manageable… like a resident tourist. I try to find opportunities to turn an “ordinary” experience into an adventure. If I need some fruit, why not do my shopping at Pike Place Market? Coffee time? I’ll try a different cafe (and aren’t there plenty of options here? Coffee Heaven!). 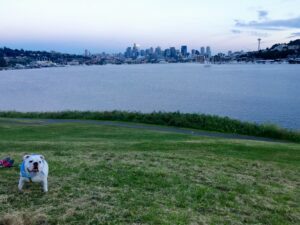 When I look back at the summer, all of the little adventure moments will add up to a fun-filled and in-depth experience of what Seattle has to offer. I can do my job, meeting all of the demands of the season, AND try to get an authentic feel for this city. 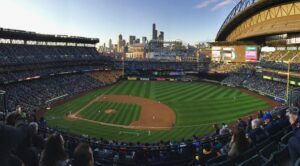 Whether you’re in-town as a visiting athlete, a traveling businesswoman, a tourist, or a Seattle native, here is what resident-touring can look like for you. Most of my days in-season are spent at the practice facility. At the professional level, training days increasingly resemble traditional business hours. We are on court with the coaches for 2-2.5 hours, but my day extends beyond that. From about 10-3, I am in the gym lifting, getting treatment, shooting, watching film, practicing, cooling down, stretching, ice-bathing… to name a few things. I love it; but I’m usually itching to get out into the fresh air by the time practice is finished. Today I need to stock up on some fresh produce to fuel for my game. Off to Pike Place Market! Pike Place Market is enjoyable for residents and tourists alike. 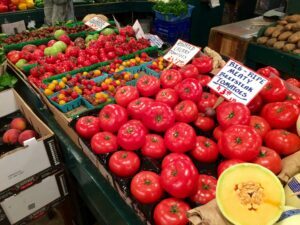 When I came to town as a visiting athlete from New York or Chicago, I loved to stroll the market and admire the produce and craft goods in my down time. I recently brought one of my friends from New York who was in town to play against us here to Pike Place Market. We picked up some DELICIOUS cherries to enjoy while we explored the market. These days, I truly enjoy the experience of shopping at Pike Place Market as a local. One of our team owners graciously gave me a tour earlier this season, and now I can navigate my way to find what I need: produce, flowers, yogurt, seafood, fresh meats, honey, tea, specialty food items, gifts… if you can dream it up, you may very well be able to find it at the market. My friends at Sosio’s understand my irregular travel schedule, and help me stock up on fresh fruit and veggies while I’m in town. On this day, I stumble upon some new friends. While admiring the peonies, I start chatting with a gentleman over the color of my sweatshirt and then the lovely art before him. Joe and his coworker are transplants from New York, and we bond over our east coast roots. Two of my brothers have birthdays approaching, and I need gifts! Joe’s artwork of saxophones and guitars is the perfect unique gift for my musical brothers. Not only can I check another item off of my to-do list, but I leave the market with two new friends. I wander through the market collecting the rest of my things, admiring the passion of each vendor. Everywhere you turn, someone is ready to help, teach, and chat with the market’s visitors. I steal a glance at the Puget Sound through the community garden and wave to the line at the original Starbucks location. Time to get home and get ready for the Sounders game! It is a beautiful evening for a soccer game. 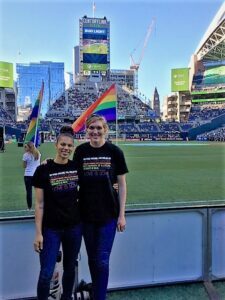 Seattle Sounders FC are playing Orlando and it is Pride Night. The sun is out and there is a nice breeze inside the stadium. I am so excited for my first visit to CenturyLink Field! Nearby pubs are filled with game-ready fans wearing their green and blue jerseys and scarves. I find my teammates and make my way into the stadium – and onto the field! Lucky for us, we have an opportunity to watch warm-ups before the game. We love the chance to get a peek into the routines of other athletes who have worked tirelessly to prepare for the game and get in the zone. We steal some photos and enjoy the electric energy of the crowd, chanting and cheering the players on before the start of the game. Excited to be a fan for the evening at my first MLS game, we head to our seats. A blaze of fire shoots into the air: game on! It’s game day! So as not to wear myself out with building anticipation and excitement, I try to balance my day with some relaxing routines. My morning begins with breakfast and shoot around at KeyArena. This is a short session at the gym where we can discuss our strategy, watch a little more film, and get some shooting in before the game. At this point, we have already worked hard to prepare, and shoot around helps us fine-tune the game plan. I appreciate the chance to get up, get my legs moving, and burn off a little energy first thing. Waiting around for an evening game can be exhausting if you let your energy stir. 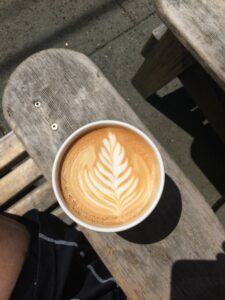 After shoot around, I grab coffee from Café Fiore in Queen Anne on my way home. Coffee is a soothing routine for me. I like to enjoy mine in one of the wooden chairs they have outside and enjoy Seattle’s beautiful summer weather. I head home and relax for the rest of the afternoon: make some lunch, paint my nails (another pre-game routine), and rest. Game time is upon us! KeyArena is a great venue. Our fans are loyal, energetic, and passionate. I remember as a former opponent that playing in the Key was a challenge. The fans create an electric atmosphere that can be daunting for opposing teams. Now as a member of the Storm, I love it! Our hard work paid off. The team plays great and we get the win! One of my favorite parts of Seattle’s summer is the long days. I miss so much sunlight when I’m in the gym, and it is refreshing to walk out of the arena in the evening and still have a little day light left. 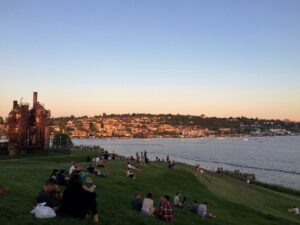 Gas Works Park is a great place to watch the city glow in the sunset and shift into a jewel-lit night-scape. 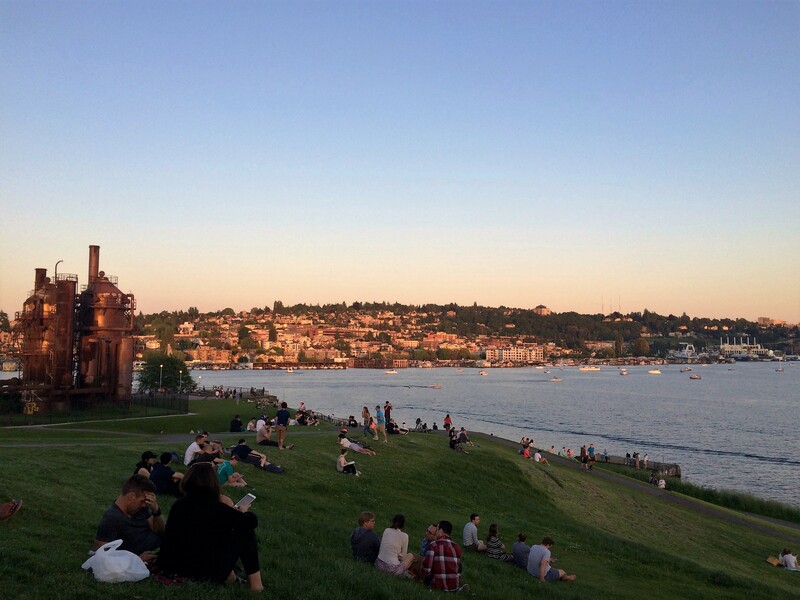 After dinner or dessert (or both) in Fremont, head to Gas Works Park with some friends or a date and enjoy the view. It is stunning. My off-days are really an opportunity for me to enjoy the outdoors. I feel refreshed when I get a taste of the summer air and sunshine. Once I check in with our trainers to complete any treatments or recovery workouts, I head to Lake Washington at Magnuson Park. I park my car and walk toward the water, watching a large contingent of UW students in what looks like a spike-ball tournament. It is a beautiful day to be outside. Families are barbecuing and launching boats from the shore. I find a nice spot in the grass among running dogs and playful kids to enjoy the sun and the view. I also make note of the walking trails and dog-park for future visits. The water is cool and refreshing. There is plenty of space to enjoy my book. I especially love the view of Mt. Rainier peeking over the lake on this clear day. A few hours in the sun, and I am ready to head home and get ready for the Seattle Mariners game that evening. Sports fans have no shortage of games and talented athletes to cheer on when they come to Seattle. Safeco Field is a great ballpark! While I am partial to Fenway, I like the size and atmosphere of Safeco. Dozens of food options inside the stadium allow me to enjoy dinner, snag a build-your-own ice cream sandwich for dessert (don’t tell coach! ), and some coffee when the game goes later into the evening. It’s throwback night at the Mariners, and my friends and I scored some 1977-logo hats. I’m officially a Seattle fan now! The Mariners and Astros are in their retro uniforms, and all game personnel are dressed as if it is the first season in 1977! Between innings we enjoy watching all the games and trivia that involve Mariners history. As a new fan, I am enjoying the chance to learn. That late-setting Seattle sun keeps the game washed in a pink glow late into the evening. Nice weather and a great game, a perfect way to enjoy a summer night. My days off are an opportunity to try some activities I might have to avoid when trying to stay rested before games. Well before my arrival, one activity I was told was a must-do in Seattle was to get in nature and hike! I grew up in a very active family. When we weren’t playing our sports and doing homework, we were outside making up games or hiking with the dogs. 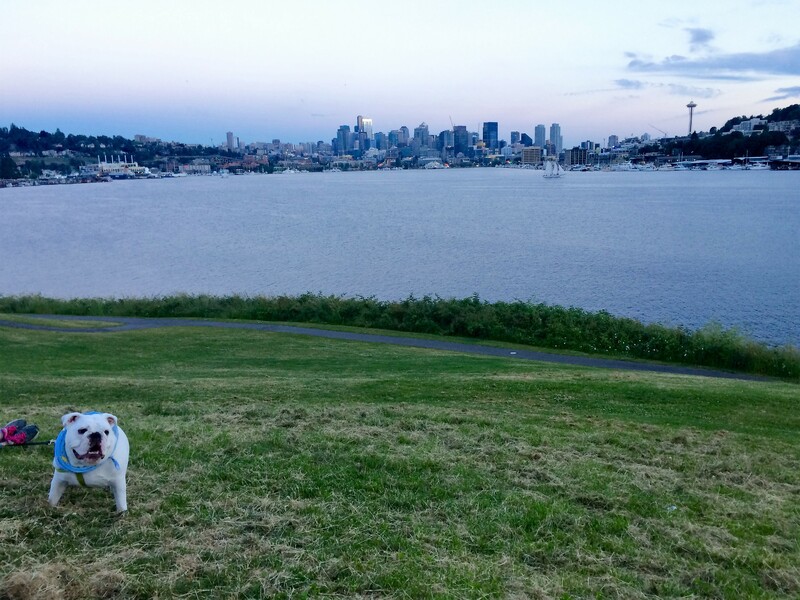 I love to get out into nature and Seattle has some of the most stunning views of it. One of our team chaplains is well versed in Seattle hiking, and I stole an opportunity to join her to hike to Rattlesnake Ledge. This gorgeous hike is one of the Seattle classics, I’ve been told, and I soon found out why. 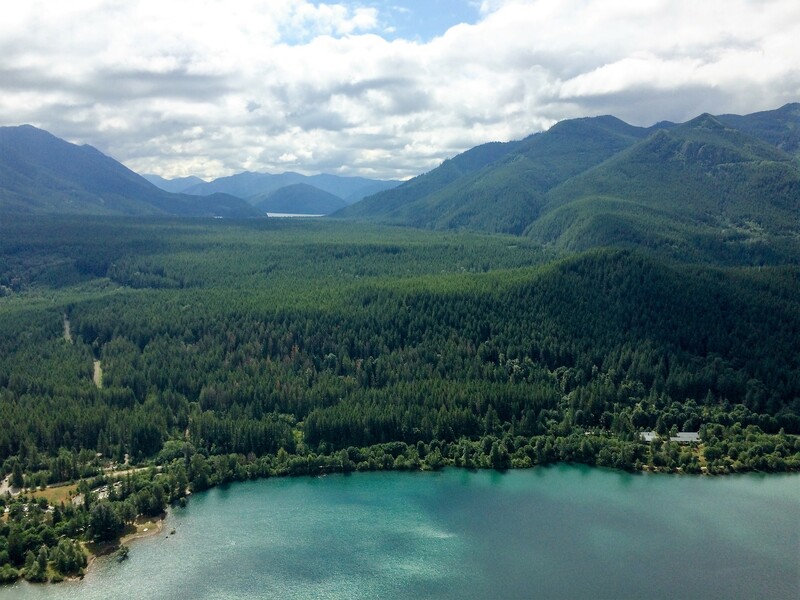 We got up early and drove to Rattlesnake Lake, where the hike begins. It is simple enough to know where to go and follow the trail, but this was certainly an active recovery day! We walked up a steady incline for a while… we chatted the whole way up the mountain and I lost track of time! Our effort was rewarded with stunning views. We sat on the ledge, continued to chat, and enjoyed a snack among other hikers overlooking the lake and trees below. The clouds change the way the sun shines on the lake below, changing its shade of blue. The trek back down is filled with just as much chatter, and I’m happy we got going early with more and more people starting their journey up the mountain. Before we know it, we’re back to ground level, heading home in time for lunch and to relax the rest of our Sunday away. Don’t let limited time or a busy schedule keep you from exploring your surroundings! Seattle is accessible to even the busiest of explorers. Find a coffee, get out on the water, taste the fresh produce, or cheer on the home team! Pick any one of these, and your quick trip will have become that much sweeter. 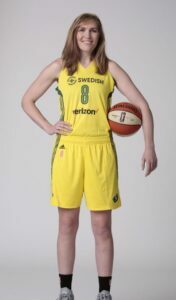 Carolyn Swords is in her 6th WNBA season as a professional basketball player, and her first with the Seattle Storm, who play at KeyArena. 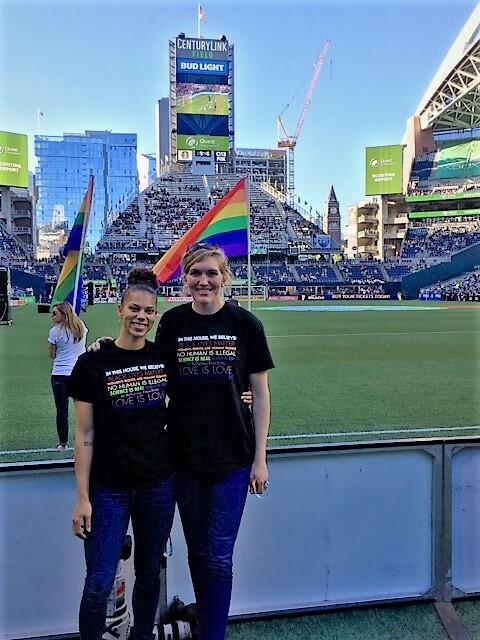 A lifetime East-Coaster, Carolyn’s first stint living on the West Coast and in Seattle began in April of 2017 when she was traded from the New York Liberty. A 2011 graduate of Boston College and native of Sudbury, MA, Carolyn has also lived in Poland, Spain, Australia, Italy, and Turkey, chasing her professional basketball career.